Where did August even go?! I feel like each year the time between my little sister’s birthday, at the very end of July, and my birthday (Labor Day weekend) keeps getting smaller. This year, it seemed to pass in the blink of an eye. Even with all the miserably humid and hotter-than-hot days, all the army crawling through attics, sweating though each days change of clothes…. Each agonizingly long day, when linked to the next, seemed to fly by. I suppose this is also a generally recognized part of aging, along with this I all too often hear people tell me about how their bodies no longer “bounce back” and it’s “only a matter of time” til I really will know what they mean. 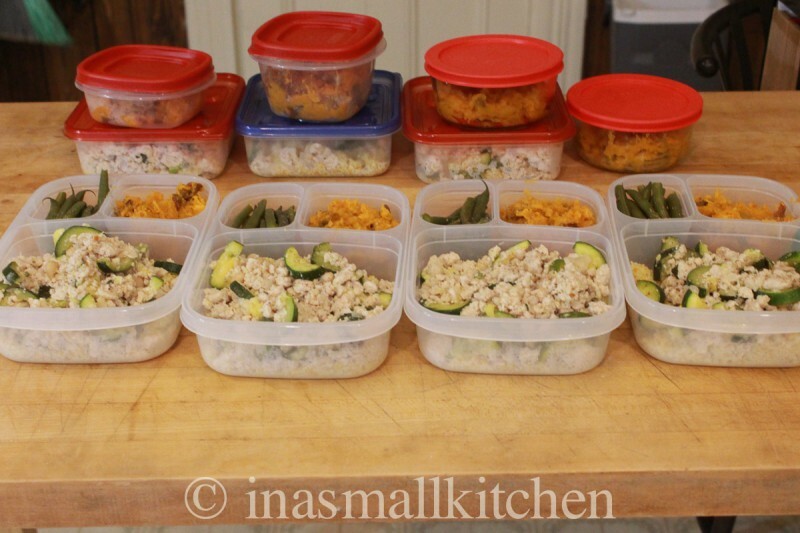 Is it any wonder that I have been thinking more and more about meal planning and meal prepping so that I can keep myself as healthy as possible. Speaking of aging… in the weeks leading up to my 31st birthday, I got very sick and though I have nearly mended at this point, it has meant that it has been about a month since I’ve set foot in my gym. As I’ve been recuperating, I have tried to start doing some yoga every day. Now that I am nearly back to100% again, I got to thinking about ways that I could get back into a better routine as far as breakfast and a lunch to bring to work are concerned. Usually I have breakfast around 5:30 in the morning, stumbling around to get a few quick tasks done at home before I rush out of the house to work. I have done either smoothies or protein shakes for breakfast in the recent past, and while smoothies were good, I want an option that can easily transition to the winter. After a few quick pintrest searches I found something that I wanted to use as a jumping off point. 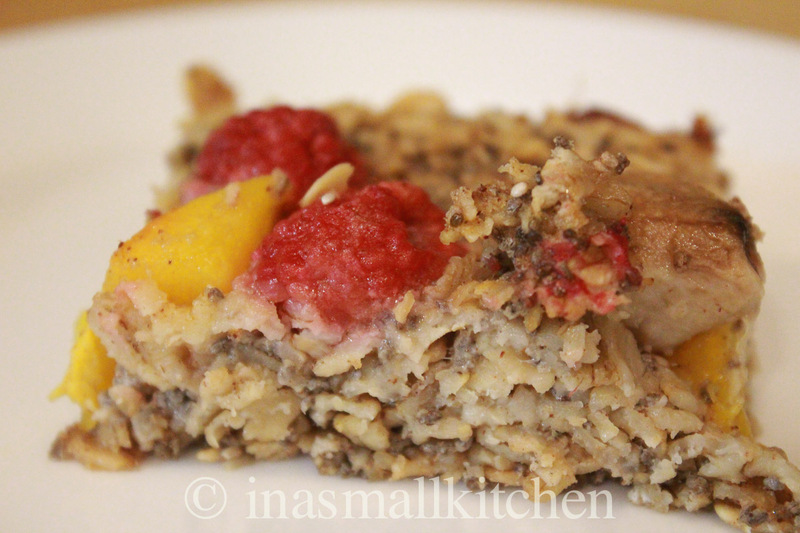 In a large bowl mix the oats, cinnamon, baking powder, salt, brown sugar, half the raspberries, mango chunks, whey powder, and chia seeds until they are fully combined. The fruits will sort of be coated by the dry ingredients, and lots of these things are lumpy, so take some time to make sure it’s totally mixed. When dry ingredients are all set, pour out into the baking dish and with a spatula, or spoon to make sure the corners are filled and the top is smoothed out so that you don’t have any high points. 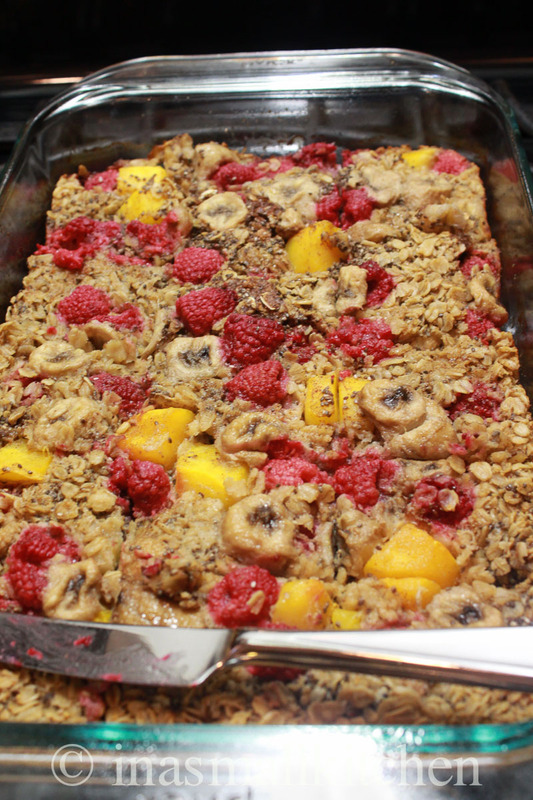 Place the remaining raspberries and banana slices on top. In a separate bowl mix the coconut milk, egg whites, vanilla extract, and coconut oil (which will not look great if the milk is chilled at all…) or greek yogurt – which ever you choose to use as a substitute for butter. Pour the wet ingredients over the dry ingredients in the baking dish, and shake to make sure that it settles all the way through to the bottom. Bake at 375, on a middle shelf of oven for 30-45 minutes, or until the top starts to brown slightly. If using a pyrex dish, like I did, you can also see the browning of the corners and the bubbling of the greased dish to see that it’s cooked through. Thank you! 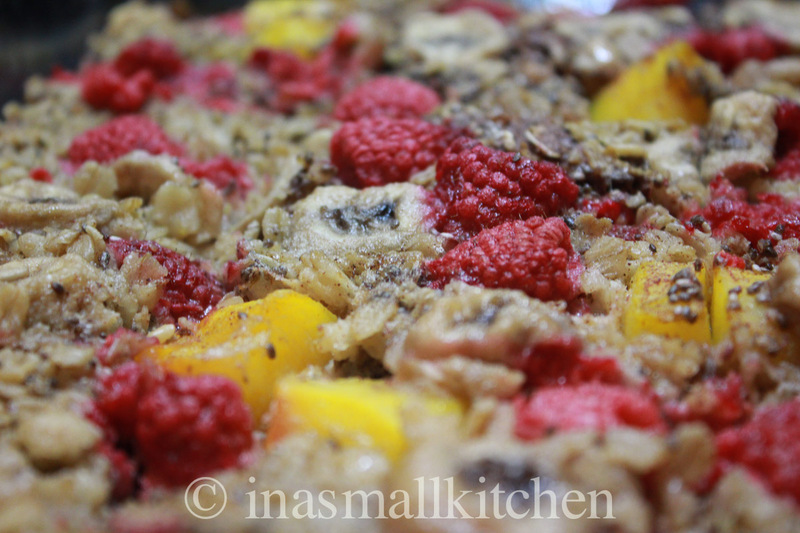 They taste pretty good too- I’ve been looking for a winter weather friendly somewhat- healthy breakfast that I can make ahead of time. Those bars look like they are packed with all kind of goodness! Glad to hear you are on the mend. Yes- they are delicious and so quick to warm up in the morning, grab and go!